Will a London cabbie lie for money? | Andy Sernovitz | Damn, I Wish I'd Thought of That! Will a London cabbie lie for money? A firm called Taxi Promotions UK is paying London cabbies to talk up their clients in what appears to be an ill-conceived stealth marketing campaign. (Full article from the International Herald Tribune.) Cabbies get free vacations and other rewards in exchange for promoting them to unsuspecting passengers. But… as far as I can tell, there is no requirement or training for the cabbies to disclose that they are paid salespeople, not "ambassadors" as they call themselves. 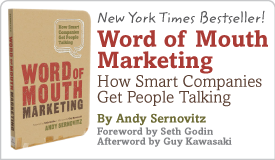 They call it "word of mouth" — but it’s not, it’s unethical shilling. I hope that the cabbies refuse, that clients learns the basics of word of mouth disclosure, and regulators take a good look at this nasty invasive procedure. Let’s review: Word of mouth marketing is honest conversation between people who share what they love about a product. Stealth marketing is paying people to lie for you. If it is disclosed – good, if not – bad. Read the WOMMA ethics code.